Are you suffering from a health issue? Frustrated by using conventional medicine? Searching for a better solution? Well, you’re at the right place. Here, we are discussing about the most effective and safe “homeopathy treatment” that helps you to get healed with all sorts of health issues. Do you want to know why homeopathy is considered as the safe and effective medicine? If yes, read on to find why homeopathy remedies are considered as the best medicine. Being practiced for more than two hundred years, Homeopathy is the most preferable treatment considered by all people. Homeopathy is a holistic treatment, which means treating the whole body including your mind, body and emotions. The main difference between the homeopathic and conventional medicine is-homeopathy stimulates the entire body instead of targeting single symptom. Homeopathy treatment is incredibly effective and works fast. Also, the risk of adverse side affect from taking this treatment is extremely small. Homeopathic remedies are safe, non-toxic and work for all age groups regardless of their health conditions. Homeopathic treatment is extremely safe and effective because its remedies are prepared from plant, animal and mineral substances, which are diluted to certain extent till the main essence of the substance remains so that any toxicity is diluted out. Due to this infinite dilution, this treatment can be preferred even by small babies and pregnant women. Homeopathy treatment is natural, safe and inexpensive, which helps to strengthen the overall immune system, restore balance and triggers the self-healing abilities. It is an alternative to conventional medicine, which treats all ailments including acute and chronic symptoms of body and mind. Moreover, homeopathy treatment works with the immune system instead of squelching it. Also, it’s not addictive; as soon as your health issue is cured you can eventually stop consuming it. In simple terms, your body will be never become dependent on the homeopathic medicine. Though homeopathy treatment works slowly than conventional medicine, it is an exceptional way to treat all health imbalances. Most people prefer it because it is less invasive, has fewer side effects and more holistic when compared to conventional medicine. Homeopathy is undoubtedly the best treatment for people who are suffering from anxiety, phobia, loss of confidence, addiction, fear, irritable bowel syndrome (IBS), asthma, exam fear, sleep disorders, eczema, etc. In-fact, the homeopathic remedies can be used to treat extremely wide range of conditions, including physical such as asthma and psychological such as depression. So, if you are facing any of the aforesaid problems, a good homeopathy doctor can help you to treat all your health issues naturally. At present, there are more than 2000 homeopathic remedies. So, definitely you can find a solution for your problem through the homeopathy treatment. Why wait? 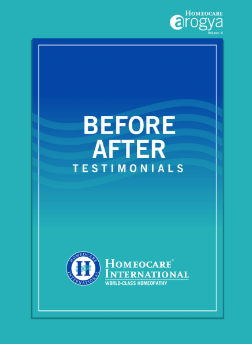 Quickly approach us @ 1800 102 2202 or shoot an email to us @ webmail@homeocare.in to book a free consultation with the best homeopathy doctor.